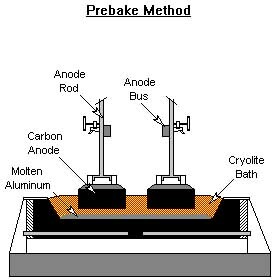 Two separate methods are used for forming carbon anodes: the self-baking Soderberg method, and the prebake method. 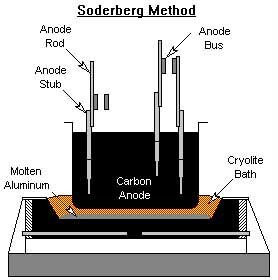 The in-cell Soderberg method bakes the anodes in the Hall-Heroult reduction cell. The heat liberated from the alumina reduction slowly bakes the carbon anode as it moves down the cell. Carbon anode paste is continuously replenished at the top of the cell. the pre-bake method forms the carbon anodes in ovens outside the reduction cell. The fully formed anodes are inserted into the molten aluminum in the smelting pot for further alumina reduction.